You may think that’s provincially owned and operated road beneath you…but it’s not. These stretches of road are owned and operated by the federal government’s Parks Canada Agency, which has a long involvement with the surrounding areas for ecological (parks) or military (Second World War) reasons. The road doesn’t feel or look a lot different, and there’s little to draw attention to the transition from provincial to federal highway. That’s because the two governments don’t want your travel experience to be a whole lot different. We both focus on safety for motorists and keeping travellers informed. We work behind the scenes to help you get to your destination safely, no matter which jurisdiction you move through. The Trans-Canada Highway in southeastern B.C. travels through federally-owned Mount Revelstoke, Glacier and Yoho national parks. More than 100 kilometres of road are maintained by Parks Canada’s Highway Service Centre. 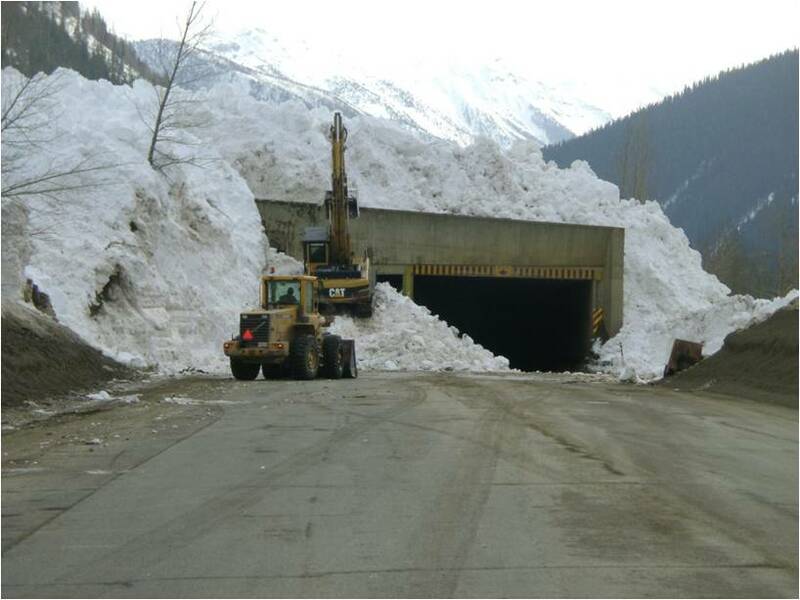 Parks Canada, in partnership with Canadian Armed Forces, operates the world’s largest artillery-based mobile avalanche control program to keep highway travellers safe from avalanche hazard in Glacier National Park. Information about road conditions in the national parks is posted on overhead highway signs at Revelstoke, the summit of Rogers Pass, Golden and near the BC- Alberta border. Federally operated roadway also exists on Highway 93, beginning about one kilometre east of Radium Hot Springs at Kootenay National Park. This section goes northeast for 102 kilometres to where it meets with Highway 1, at Castle Junction, in Alberta. Because DriveBC is where the public looks for current road conditions, Parks Canada provides the BC Ministry of Transportation and Infrastructure (us) with highway information for all four parks, which we post on the website. Should you encounter road conditions of concern while travelling through these federal areas, Parks Canada is ready to respond. For Revelstoke and Glacier National Parks, contact Parks Canada toll-free at 1-877-852-3100 and let them know where you saw the problem. For Yoho and Kootenay National Parks, call Park Canada’s Banff dispatch at 1-888-927-3367. If you’re not sure which national park you’re in, or if you’re even in one of the parks, call our contactor Emcon Services at 1-866-353-3136, to tell them of the location. Webcam view toward the federal stretch of Highway 4, through Pacific Rim National Park Reserve. When heading for Tofino on Highway 4, through Pacific Rim National Park Reserve, you’ll again be on federal land. 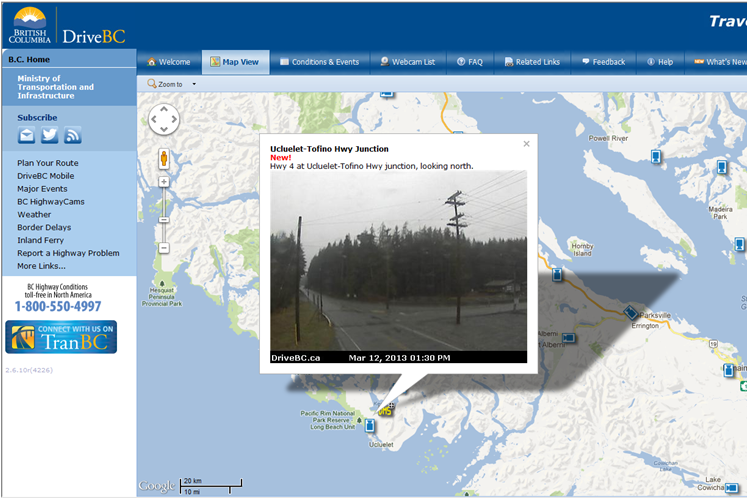 Two message signs, between Port Alberni and the junction by the park, alert drivers to conditions on the stretch. Should you have any concerns with highway conditions within the park reserve, call Parks Canada’s 24-hour phone line at 1-877-852-3100. If you’re not sure whether you’re in the park, make note of your location and check in with our contractor, Mainroad Mid-Island at 1-877-215-6006. 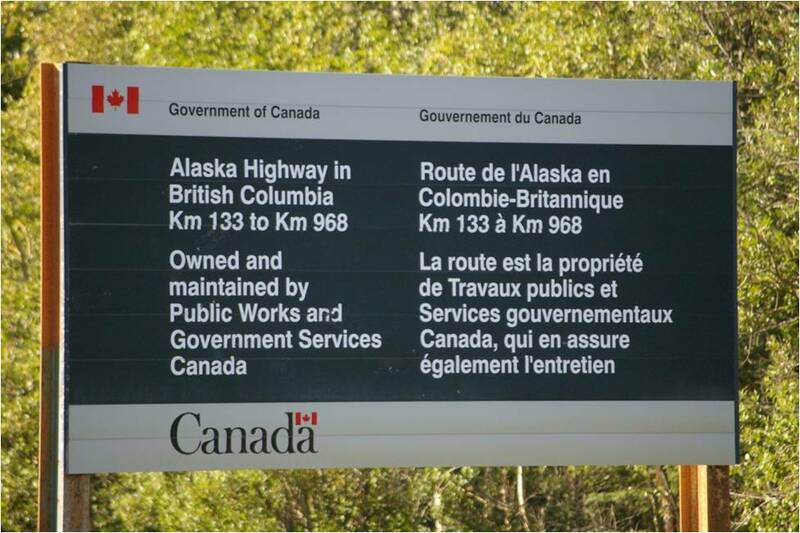 Motorists on Highway 97 will find themselves on federal highway, once they get exactly 135.57 kilometres north of Dawson Creek — a spot also known as Mile 83 of the Alaska Highway. The Alaska Highway was built through Canada to connect the US to Alaska during the Second World War, and was an epic feat when completed in 1942. During the late 1960s and 1970s, the provincial government paved from Mile 0 at Dawson Creek, to Mile 83, and eventually the remainder of the route to Delta Junction, Alaska was hard surfaced. About two kilometres before Mile 83, the provincial government has a riverside rest area which offers running water, flush toilets and a playground. The federal government’s overhead message sign is strategically located nearby to let you know of any conditions or concerns further north. The rest area is the last place to turn around for a long way, should travellers decide the extended, steep hills of the famed 2,232-kilometre Alaska Highway are more than they want to take on. For a short section through Fort Nelson townsite, the road becomes provincial again, then it’s back to being federal highway. Should you spot problems on the federal route, contact 250-774-6956. If you’re on provincial road, call our maintenance contractor, Yellowhead Road and Bridge at 1-888-883-6688. While the ground beneath you doesn’t change in any physical way where sections of road become federal highway (and you may not even notice a difference between provincial and federal routes) it’s an interesting distinction. The provincial and federal governments work together to make sure the highways are safe and the transition between the two jurisdictions is seamless, so you can keep your eyes on the road and enjoy BC’s spectacular scenery. Not sure who to call, when you see an issue on any of our 47,000 kilometres of provincial highway? Check to see which service area you’re in, on our Highway Maintenance Boundary Maps. Once you’ve noted the service area number, you’ll find it and the maintenance contractor’s contact information here. The USA has nice paved roads, they are always looking after their people on the road. Maintenance, maintenance. A little less alcohol for Christmas parties and use the excess cash for maintenance. Hi, I was wondering if the Federal Government may consider an emergency service provider for the desolate stretch of road along Highway 97 between Fort St. John and Fort Nelson? I would like to provide details on this proposal. Athabasca County in Alberta has a similar program where they sub contracted emergency services to a contractor along Highway 63 due to the extended travel time from the nearest first responders. Now that Canada LNG is going ahead, there will be an increase in highway traffic again, as seen in 2013, along with the increase in motor vehicle incidents. If a person has a collision or roll over near Pink Mountain, for example, it could take over 2 hours for fire/ rescue and BC EMS to arrive. Highway 97 sure changes with the jurisdictions. Traffic Light after traffic light for hundreds of kilometers. When I drive from here in Vernon to Osoyoos it’s over 3 traffic lights every km for 180km. As soon as I cross the border, the highway is straighter and wider with less build-up right to the highway. Plus, I can drive on average 15km/h faster. When I take 97 north, it’s lots of traffic lights again and lots of sharp corners. Then I get past Fort St. John, and it’s smooth sailing except for the provincial part around Fort Nelson and the windy parts over the Rockies, but those are being straightened by the feds, so it’s a far better road than the 97 from Prince George to Dawson Creek! Hello Thomas and thank you for your question. BC sure is becoming a busy place, isn’t it? As communities grow and evolve around highways ( as we see happening along Highway 97 in the Okanagan), traffic volume levels require traffic lights to allow those communities access to major highways. When traffic volumes increase exponentially and as budget allows we try to install overpasses to accommodate. But the road DOES change. The potholes and damaged sections of the road through the Park on Hiway 4 are causing accidents, damages and hundreds of dollars in repair bills. It is absolutely ridiculous that we have to travel that road daily in that condition! Should you have any concerns with any part of Highway 4, please contact Emcon Services at 1-866-353-3136. The contractor provides maintenance for both the federal and provincial governments.